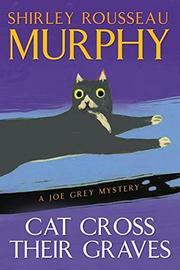 Feline sleuths help rescue a frightened waif and solve the murder of a beloved resident. While the California coastal town of Molena Point is hosting a film festival honoring Patty Rose, a winsome Hollywood film star of half a century ago, Patty herself is being murdered across town by a secret intruder. This killer fails to notice that he’s being followed by Kit, the overcurious detecting cat recently supplementing the exploits of series veterans Joe Gray and Dulcie (Cat Seeing Double, 2003, etc.). Kit’s shadowing leads her to a remote cottage where she becomes trapped, prompting a search by her feline cohorts. While Capt. Max Harper and stolid detective Dallas Garza begin their measured murder investigation, the cats discover a more urgent crisis: a young runaway named Lori, fleeing a sad past and a criminal secret revealed piecemeal in quick cuts from her perspective. Captured by the mystery man and freed by Kit’s teeth and claws, Lori finds a measure of safety in the home of elderly Genelle Yardley and Cora Lee French, who unearths the grave of a child while digging weeds in her back garden. The solution connects this mystery with Patty’s death and Lori’s secrets. The somber plot is leavened by the author’s affection for her characters and their rewarding small-town lives. Newcomers to the series, however, may find it hard to keep up with the growing cast of continuing characters.